PISHIN: The funeral prayers of the three security officers, who were martyred earlier today in a remote-controlled bomb blast here, were offered Friday night. The coffins carrying their bodies were wrapped in the country's flag and were given a guard of honour. Among the attendees at the funeral prayers were Commissioner Quetta, Levies Forces Director-General, Frontier Corps' Sector Commander and Commandant FC, and District Police Officer (DPO) for Pishin, as well as various other officials. 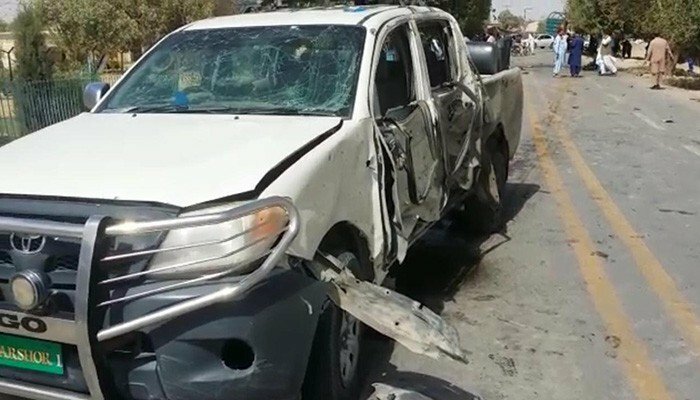 Three Levies personnel were martyred in a blast Friday morning on the northern by-pass in Balochistan's Pishin district. Three other officers were injured in the blast that had targeted the vehicle of an assistant commissioner. Police said the remote-controlled bomb was planted on a motorcycle and the assistant commissioner was not present in the vehicle. An investigation into the incident was subsequently launched.